Breaking news: there is a Twister headed your way! Click here to play! Can you escape in time with all the cash winnings? Make your way to the outskirts of town and win yourself some huge payouts. 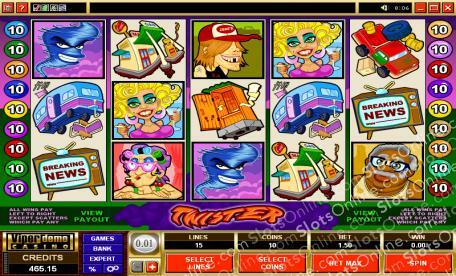 Twister is a 5-reel slot played across 15 lines, with the more lines activated increasing your payout odds on winning combinations. The Twister symbol is Wild and can be substituted for any other symbol on the reels except Scatter, and can pay out up to 15,000 times your initial wager. The TV is Scattered and will earn you 20 free spins when three or more of them appear on the reels. Twister has an added feature that allows you to double your winnings via the Gamble Feature. You can Gamble your winnings as many times as you wish until the Gamble Limit is reached. Take your cash and get out of the way of the Twister on this excellent slot today! The Breaking News symbol is Scattered and will earn you 20 free spins when three or more appear on the reels. The Twister is Wild and can be substituted for any other symbol except Scatters, and can pay out up to 15,000 times your initial wager.